Today the Supreme Court of Canada unanimously ruled that Vancouver’s Insite clinic can stay open and that Ottawa has to back off. In a ruling based on evidence and research showing that Insite saves lives and promotes rehabilitation, the Court declared that Ottawa’s attempt to shut down the site undermined the protection of health and public safety and violated the Charter of Rights. Insite supporters celebrated the win. “This is the triumph of science over ideology,”said their lead lawyer, Joe Arvay. 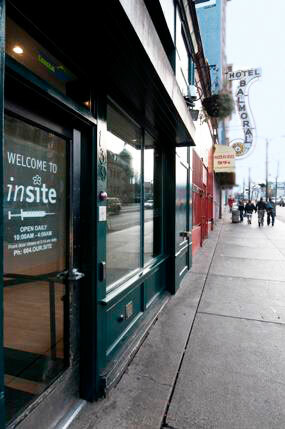 Insite opened in September, 2003 as a safe, sanitary, medically-supervised place where addicts can inject drugs. In this downtown Vancouver location, people “inject drugs and connect to health care services – from primary care to treat disease and infection, to addiction counselling and treatment, to housing and community supports.” It is funded by the BC Ministry of Health and is North America’s first legal supervised injection site. In fact, the B.C. Centre for Excellence in HIV/AIDS reports that since Insite opened, there’s been a 30% increase in the number of addicts who enter detox and the Vancouver Coastal Health Authority says there have been more than a million safe injections at the site with more than 1,400 overdoses but not a single death. Prime Minister Harper has said that he is disappointed in the ruling, but that Ottawa will comply. This will likely fan the flames of Tory contempt for judicial powers though. It is also unlikely to change the Conservative approach which rejects that addition is an illness best treated by doctors instead of police and prison guards. I predict that in the years to come the courts will be hearing more cases in which citizens groups challenge tough-on-crime legislation as reducing public safety and violating Charter Rights – especially given that legislation before us now is based on ideology, not evidence. But today I’m grateful that we have a Supreme Court with the authority and wisdom to protect human rights from political ideology.